We target people with an open mind, good vibes and great willingness to experience the adventure of a new way of traveling. We dare you to enjoy a different weekend with the surprise of an unexpected destination. Next-Where is responsible for everything concerning flights and accommodation, and we also keep the destination a total mystery until 48 hours before your flight leaves. Knowing that you have a fully programmed holiday weekend and not knowing where is simply fascinating! It's about traveling by surprise! We offer a novel and easygoing way to travel around America and surroundings. The surprise of the destination is part of the adventure. Once you tell us which city you want to leave from and select your weekend we will take care of the air tickets and accommodation. You just seat back, relax and enjoy your amazing surprise weekend getaway! What is a surprise destination? It is the city that Next-Where will choose for your trip. You will find out 48 hours in advance of your flight. Can I choose the destination? No. The idea of ? ?traveling by surprise would be distorted. Next-Where offers you the great alternative of living an adventure on your weekend trip. Can I find out before the surprise destination? We know you will get a little bit anxious. If you wish you can tell us at when you want us to communicate the destination but not before the Monday prior to your trip. The idea is that the mystery/surprise will be part of your experience! What is a departure city? It is the city of origin where the airport of departure and arrival of your flights is at. You do not necessarily have to reside in it. Once you indicate your city of origin Next-Where shows 20 possible destinations. You have the option to discard destinations that you do not want to visit, the first two discards being free. Then you can delete destinations up to a maximum of 10 for the payment of $ 20 each. From the remaining cities your destination will be selected. Why does it ask me to indicate if I have a valid passport? Because if your passport is valid, your surprise destination can be a city from another country. Indicate the number of travelers (minimum two), your seat and whether or not you have a passport and then click on the "Start" button. The web will guide you in a practical and agile way until you make your reservation online. Can I check the costs and make changes before completing the online reservation? Of course. You can make the modifications of cities and define schedules as many times as you wish before the final step of payment. Can I choose a destination city? No. And that's the fascinating thing about Next-Where! Not knowing the destination will transform a simple trip into an adventure. For each departure 12 cities are proposed and one of them is your destination. You have the option to eliminate one free and up to seven for the amount of $ 10 each. You can see all possible destinations after selecting your departure city and clicking the "Start Now" button. What happens if I do not want to go to the surprise city assigned to me? We hope that is not your case. We offer the possibility of eliminating cities that you do not want to visit so that this does not happen. But we know that each city has its charm and offers possibilities to discover. In Next-Where we have studied destinations that offer activities and alternatives of interest that we detail in the city guide offered through our mobile app. Open-mindedness and good predisposition are welcome! We recommend booking at least 2 weeks in advance because the flight seats are limited and the values may increase. However, as long as there are places available in our calendar you can make your reservation. When will I find out my destination? Forty-eight hours before your flight your destination will be available by accessing “My Reservation”, it will also be informed to your contact email & via mobile app. We will also send flight and accommodation information and a necessary portfolio for transfers and information of interest. You will be provided all details so you can check-in to your corresponding flights and hotel accommodations. How will my accommodation be? In each destination we have selected a series of hotels with similar characteristics to achieve alternative accommodation. In general, these are design or boutique hotels rated two stars or higher, located near the center and in neighborhoods with easy access to public transport. Click here to view some of the accomodations that we work with in each city. Does the accommodation include breakfast? Usually, the accommodation does not include breakfast. However, the chosen hotels can offer this service on behalf of the traveler. It is not ruled out that in some cases the accommodation could include breakfast. Are activities of any kind included? Why is transportation not included to / from the airport, or the rental of a car? We do not include these services because they are too complex to coordinate or supervise. However, we can suggest efficient forms of transfer or car rental agencies at airports. For how many people will my room be? The rooms are all with private bathroom and the accommodation will not be shared with strangers. If it is a group of travelers can be double, triple and quadruple rooms to suit the quantities, but there is the possibility that they are accommodated in different rooms in case the hotel does not have the required capacity. When making your reservation you must indicate preference of beds and arrangement of couples. For now, we do not offer that possibility. Two people is the minimum. Anyway, you can send us your contact info and we will let you know as soon as we have that option. Is there any special requirement to travel? Only to have your current identity documentation (ID or driver's license) up to date. In case of travel abroad you must have your current passport updated. In case you do not have it, make sure to check “no” when prompted if you have a valid passport. Why do base prices vary? The Sunday option prices (3 days / 2 nights) have a base of $ 499 per person and the Monday option (4 days / 3 nights) have a base of $ 599 per person for most weekends. These prices can be increased by: a) holidays or special demand weekends; b) increases due to last-minute reservations; c) events or special events in certain destinations; d) seasonal increase of airlines. Also, the prices will be adjusted by: a) elimination of possible destinations; b) special flight schedule requirements. In all cases the adjustments will be reflected in the shopping cart of the online booking prior to the decision to hire the reservation. The price includes departure and return flights as well as accommodation. The price does not include the official taxes effective in the US. It can happen that in some airports or in some hotels there is a special rate that must be paid by the traveler. How is payment made? Can it be financed? Do I have to pay for luggage? Usually commercial airlines in the US accept to dispatch a suitcase at no additional cost in addition to cabin baggage. However, some low-cost flights usually charge for checked baggage and are strict in cabin dimensions. Next-Where does not cover any expenses for checked baggage and advises to consult the corresponding airline which are the conditions required for the traveler. On which airlines will I fly? The airlines we work with are the commercial ones. You may fly over a traditional line or a low-cost line. It will depend on the host airport, the dates and the current demand. Can we travel in a group with my friends? Obviously, and we highly encourage it! If you book separately, it would be important to indicate in the observations section of your reservation who make up the group to add them to the trip together. If the destination is abroad should I bring the local currency? Usually you can exchange dollars at the exchange agencies of the airports on arrival or in the center of the city. Should I tell my bank that I will be traveling? Once you know your surprise destination, it is advisable that you communicate with your bank or the entities that operate your credit cards to let them know your intention to travel so they can authorize transactions that you may perform in the destination. This way you can avoid inconveniences or delays when you have to use them. Can I cancel or modify a reservation? We do not guarantee returns or changes. Upon completion of your reservation, the purchase of flight tickets is made immediately and the accommodation is contracted, so there are no lapses for cancellations or modifications. Can something go wrong in the stay? We trust that nothing will go wrong, but in the event of any inconvenience or complication that may occur during your stay you can communicate by phone or by email 24 hours a day for the duration of your trip. Can I gift a Surprise getaway? Of course! You can do so by clicking here. What is the Next-Trip promotion about? It's an exclusive Next-Where promotion for our travelers! At the end of your trip you will receive a notification via e-mail of the Next-Trip promotion that consists of a discount code of 5% of the value of the next trip you make with Next-Where. This code is valid to be applied only once within a period of six months of issuance. It can be transferred and applied to any of the Sunday or Monday options and has no restrictions on the number of travelers. I'm visiting the US. Can I book a surprise getaway with Next-Where? There should be no inconvenience to do so as long as you have an address that we are able to locate yourself in the US. Tourists, itinerant travelers or people of passage must have a reference hotel or accommodation address where they can contact and make shipments, at least one week before the trip. Next-Where will not be responsible for situations of flight losses, inconveniences to arrange the documentation in term or immigration problems that could happen with non-resident US travelers. If I want to travel again with Next-Where. Will I get a different destination? When reserving your trip, you can eliminate up to three destinations for free, make sure to eliminate any previous destination that you already visited with us. If you do not, we can not guarantee that the same destination won’t be selected. Can I add the frequent flyer miles? You can do it but after having traveled. In order to keep the surprise at the destination, we do not accept frequent flyer numbers. In general, airlines allow you to attach the loyalty number after you have taken the flight. 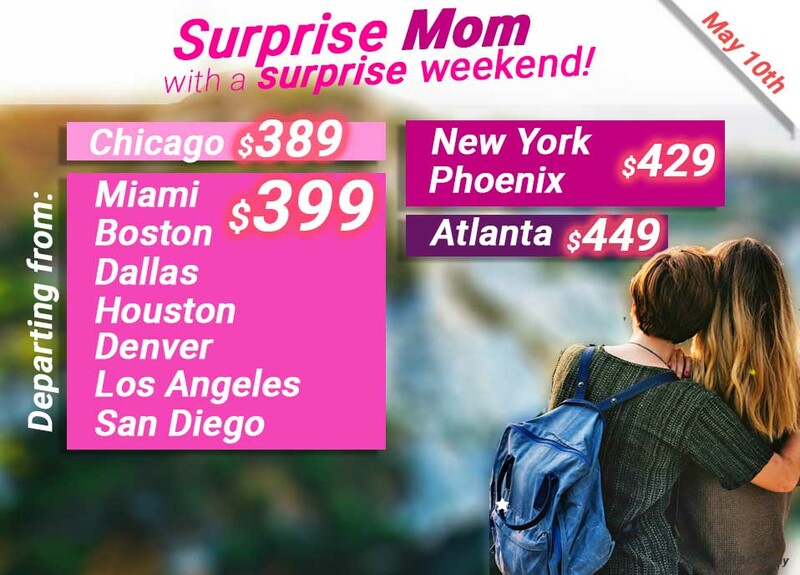 How do I book a surprise trip? Booking a surprise trip is really easy just follow this 5 simple steps. 1. Select number of Passengers & your departure city. 2. Select the weekend you wish to travel in the calendar. You can choose to return on Sunday or Monday. If you need to apply any time restrictions you can do so in this screen (fees apply). 4. Carefully fill out each passenger’s information and apply any promo code you may have to your order. Please, take the time to review your order for any mistakes. I don’t see my departure city listed. May I travel anyways? If you don’t see your departure city listed as a departure don’t panic. Click where it says, “submit a request” and fill out the form. We will create a trip departing from your city in 24 business hours. What days are the flights on? Departure flights to surprise destination always leave on Friday. As we have two travel options: if you choose the Sunday option, the return flights are on Sunday and if you choose the Monday option, the returns are on Monday. Departures to the surprise destination are scheduled for Friday. The returns to the the city of origin are scheduled for Sunday or Monday depending on the option contracted. They can leave at any time within said days. However, if you have a special time slot priority, you can use the time filter at the time of making your reservation for an additional $ 20. Next-Where guarantees a minimum of 48 hours in the destination city in the Sunday option and 72 hours in the Monday option even if you have not opted to set a time priority. In general, it is intended that the departure flights be during the morning of Friday and those of return in the afternoon. Next-Where is not responsible for delays, rescheduling or flight cancellations. In those cases, passengers have the rights and rewards that airlines agree to when purchasing their flight tickets. If the delay is greater than 4 hours, the airline must offer food and drinks and if the flight is rescheduled for the next day, the airline must also offer accommodation and transportation to the assigned accommodation. In the event of cancellation of the flight, the airline is responsible for relocating passengers on another flight or returning the ticket. Can passengers with special requirements travel? Of course. If any of the passengers requires special assistance, whether due to reduced mobility, special medical equipment or any other type of assistance at the airport, you must indicate this when making your reservation in the observations section. We will do our best to facilitate the trip and make it a special one! It will depend on the pregnancy period. You should consult with your doctor before making the decision to fly. Beginning at week 28 and whenever the pregnancy is uncomplicated, pregnant women are required to carry a medical certificate stating that they are "fit to fly". However, some airlines reserve the right to travel to pregnant women over 28 weeks. Yes of course! Families are welcome and we are sure that everyone will have a great time. When traveling with your children, indicate in comments suggestions of likes, interest in activities or preferences to share, so that we can make an evaluation of the surprise destination that can best satisfy them. If necessary, we will communicate in advance to expand information. In Next-Where individuals under 21 can not travel alone. They may do so accompanied by an adult passenger who must have them under their care and demonstrate a relationship of kinship or duly certified legal authorization. Minor passengers can travel without their parents or legal guardians as long as they carry both their passport and a travel authorization permit signed by their parents duly certified. We suggest consulting the current legislation in each case both for flights within the country and to travel abroad. In such circumstances, Mitnites Corp. is not responsible for any controversy that may occur, being the responsibility of the Client and his accompanying travelers to take cognizance of the current official information on travel of minors. Do you have a special rate for children? For children under 2 years we have a rate of $ 200 in any of the options of stay. Children over this age must pay the adult rate. Please contact us for more details. Unfortunately, the gift card purchase is final. Why do you ask me for a departure city? This is just to ensure that the recipient will be traveling from one of our host cities. I changed my mind. He/she doesn’t deserve that awesome gift. Can I use it to book a trip for myself? Of course, just use the gift code on your next reservation. Can I transfer the remaining balance? No, the gift card has a one-time use. Make sure you use the entirety of the gift card when reserving your trip. No, the gift card does not expire. How much is a surprise gift? That is up to you, although there is a minimum amount of $100. How is the gift delivered? We send you a PDF version so you can print it at home and give it in person. How does the Surprise Gift Work? The sender purchases a gift card of a desired amount. The recipient gets a unique gift code. The recipient enters the code when booking his/her trip and the gift amount will be deducted from the total of their reservation. What are the Terms and Conditions of Use of NW App? By making a reservation you must accept that you have read and understood all the T & Cs that are displayed on the Next-Where website and that also contemplate the use of the mobile operating platform through the NW App. A reminder of these is displayed at download it to access its use. You can access our T&C here. How does the scavenger hunt system work in the NW App? The Scavenger Hunt game is activated through the NW App. The system is very simple and automatic. There are predetermined “tasks” to be completed after each completion a new task will be activated. At the end of the hunt the user will receive a prize. On what operating platforms does it work? The NW App is designed to work under the iOS and Android operating systems. What requirement must I meet to eliminate it? None. There is no type of requirement or condition to remove it from your mobile device when you consider it appropriate. How long should I keep the NW App on my cell phone? There is no time limit to continue with NW App on your cell phone, and you can also unsubscribe at any time. It is advisable to keep it active even after completing the trip, in order to access information related to subsequent offers, reminders, or to stay active as a Next-Where traveling member. Why do I need to download it? What is the cost of the NW App? It has no cost to the Client. How do I get the NW App? After you book your trip with us you will receive a download link in your confirmation e-mail. It is not available to obtain it previously or if you are not a Next-Where Client. What is the Next-Where App for? Next-Where App (NW App) is an add-on offered by Next-Where inside your contracted Pack so that, through your cell phone, you can consult and permanently inform you of the specific details of your trip. What is a City Hunt? It is an engaging and interactive way of getting to know your destination a little bit better. You will be given hints/clues to complete tasks around your destination. After completing all tasks you will receive a surprise gift. Do I have to complete the City Hunt? No. The city hunt is optional and is already included in your surprise package. It is an assignment that the user must complete in order to unlock the next one. After all tasks are completed the user will have finished the hunt. How many tasks are there in each city hunt? The number of tasks vary depending on each city. Usually there are 6-10 tasks in each destination. What happens if I am stuck in a particular task? You can always contact us for help, but we encourage you to think (everyone should be able to complete all tasks). Is there a prize for completing the city hunt? In most occasions we give the users that complete the hunt a surprise gift to enjoy at their destination. Where do I start the City Hunt? You can start anywhere. Just go to the section of the app called “City Hunt” to start playing. No, but you will eventually be returning home, so hurry up before you have to catch your flight back! How long does a City Hunt take? It is designed to take from 2-3 hours depending each city, but you can do it at your own pace. The idea is that you enjoy the city while doing the hunt. Can you give me an example of what a clue looks like? Okay. Lets pretend the hunt is in Chicago. An example of a clue would be: Famous for brick and house but not for being a constructor. He stood out as a commentator and was given a statue. The clue would be referring to Jack Brickhouse Statue on N Michigan Ave.
What is the Collaborators Program? It is a program where the user submits different tasks and earns NW Points valid towards a surprise trip. Anyone who is 18 and older can become a collaborator, although a person of 21 years of age must be present at the time of travel. How many NW Points do I earn for each task? Each task has a different NW Point value here is a list of each task. How much is a NW Point worth? Each NW Point is worth $1 towards a surprise trip. Every entry is checked by a moderator for creativity, relevance and originality. We are looking for more than a copy and paste from Tripadvisor. When do I get credited for my collaboration? You will be credited once your collaboration is accepted. Login to your collaborator account and select “Reedem Points” – Please allow 48 hours for your request to be processed. Can I transfer my redeemed NW Points to someone else? Once you redeem your NW Points you will get a Gift Code for the amount of points completed. Of course, you are free to transfer it to your friend or loved ones. Can I redeem my NW points at any time or I must accumulate a certain number? You can redeem them at any time, if you have 10 points, you will get a gift code worth $10 towards your surprise vacation. I redeemed my points and now I submitted more collaborations, can I combine them?